The eXpress Maintenance Module adds additional capabilities to eXpress to support the development of maintenance diagnostics and IETMs. With the eXpress Maintenance Module fault groups developed in eXpress diagnostics may be converted to Fault Templates which represent the suspected components, functions or failure modes of the fault groups. 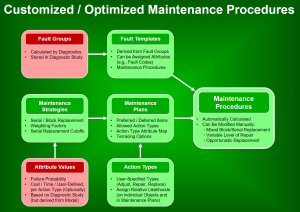 Once created the fault templates provided a means of managing diagnostic maintenance details. 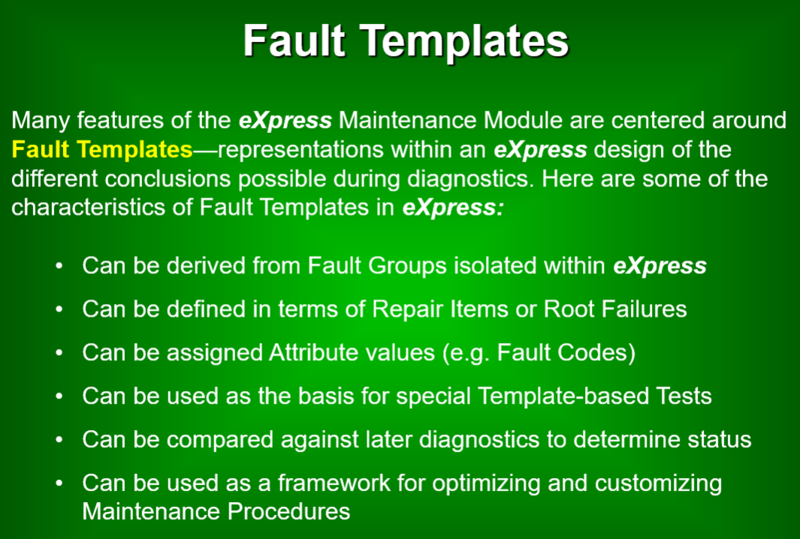 Fault templates are at the root of all of the features provided by the eXpress Maintenance Module. 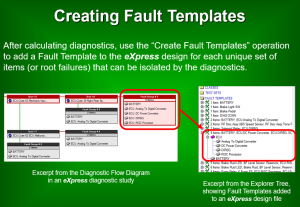 A fault template is an eXpress design element that represents the contents of a fault group that has been or can be isolated by the diagnostics. A fault template provides a way of assigning attribute values (e.g. fault codes or maintenance instructions) to isolated fault groups. Moreover, tests defined in terms of fault templates can be used to create secondary diagnostic procedures that extend the fault isolation achieved by primary diagnostics. Because fault templates are saved as part of the eXpress design, and not in the diagnostic study, they can be reapplied each time that the diagnostics are calculated for that design. The maintenance module can be used to automatically assign fault codes to the fault templates using rules based upon the set of fault codes that have been defined as available and the structure of the design. Generating fault templates using the primary diagnostics to define the fault templates. 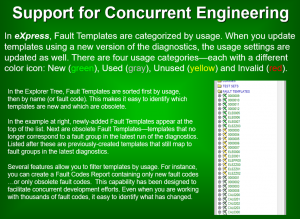 Create tests based upon Fault Templates from the primary diagnostic. Build secondary diagnostics using the tests created from the fault template as the starting conditions for the secondary diagnostics. 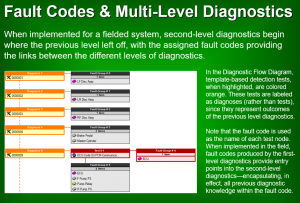 This advanced feature within the eXpress Maintenance Module enables the “automatic encapsulation” of “diagnostic conclusions” within the assignment of the (BIT) Fault Codes operation. This establishes a means to bridge any comprehensive diagnostic acumen gained from the primary diagnostic session – as typically produced in on-board applications using BIT – and then to be (re)used in the secondary diagnostic environment – or typically in the guided troubleshooting environment. This consistently positions the secondary session to experience more effective fault isolation success. 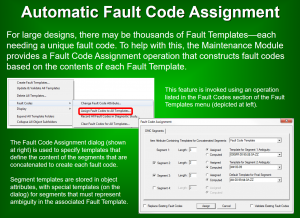 The Fault Code assigned to the Fault Template. 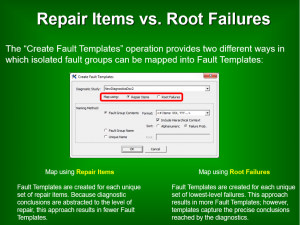 The suspected items, functions or failure modes within the fault template. Attribute values of the fault template suspects (e.g. part number, LCN, nomenclature). The current status of the fault template (e.g. Newly Added, Obsolete, or Previously Existing). The eXpress Maintenance Module can facilitate a highly effective automated approach in the IETM Development effort that can dynamically map and sequence test and repair procedures to corresponding “smart” Fault Codes. Should the design change, the Fault Templates provide a convenient mechanism that enables the “auto-remapping” of any Fault Codes to any changes in the diagnostic differencing or the Fault Group constituencies as reflected during development and/or during the sustainment lifecycle for any modifications to the operational design. 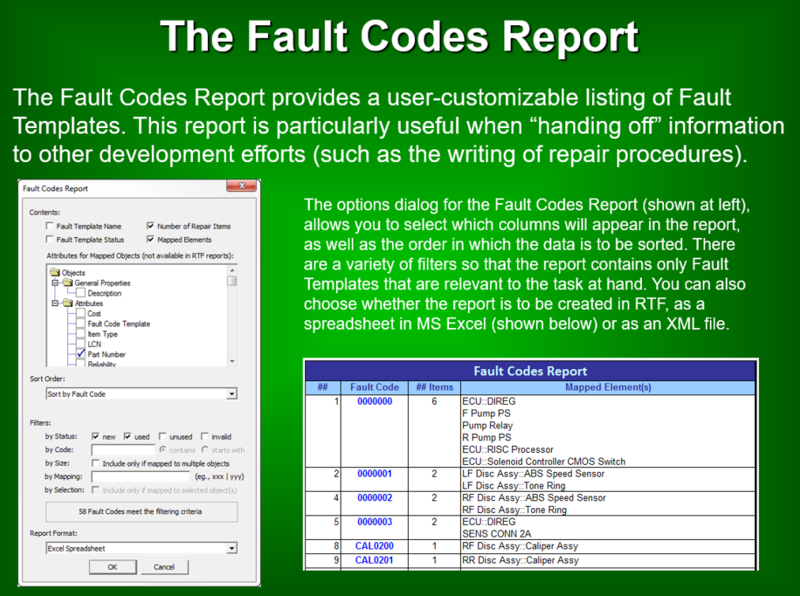 The eXpress Maintenance Module Fault Code Template Report provides a simple means to identify any data retained in the Fault Templates and in an interoperable form for immediate reuse. Since the Guided Troubleshooting details is able to be “linked and rejoined” during the secondary diagnostic sessions, its compatibility with other related industry preferred data exchange standard formats (including S1000-D or ATML, etc.) can leverage the diagnostic savvy inherent to this fully integrated diagnostic approach which is not otherwise transferrable. 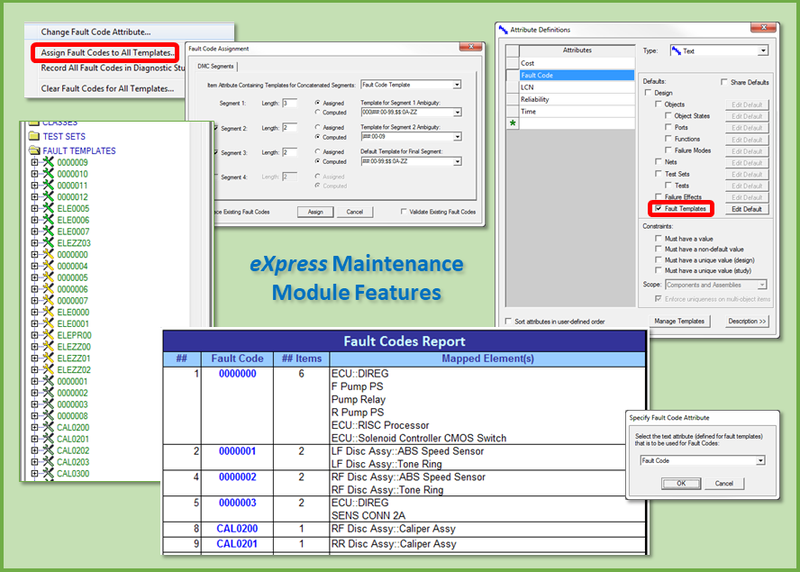 The eXpress Maintenance Module is a companion “plug-in” module for eXpress. As integral tools within ISDD, their combined capability redefines the “fixed” core aspirations of MBSE or traditional Lean Development processes. The eXpress Maintenance Module contributes something brand new to the most demanding “Smart Lean” Development processes. Any proposed change to the design will have a new impact on the diagnostic effectiveness of the deployed or operational asset. 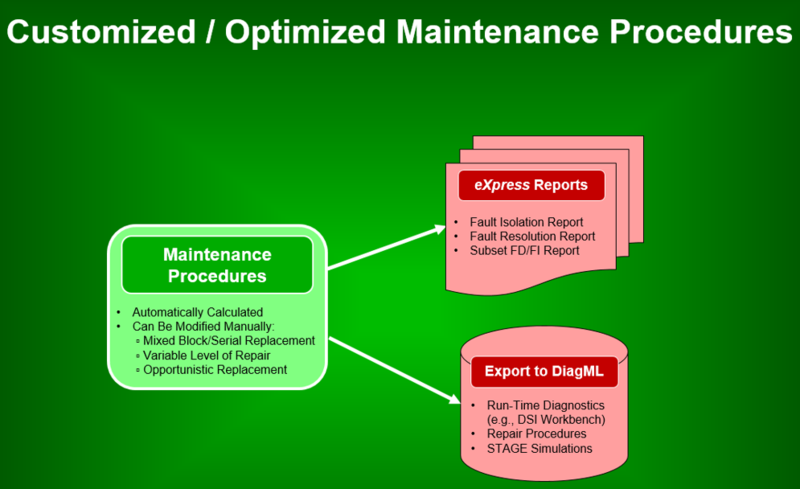 The eXpress Maintenance Module facilitates another opportunity during Design Development to assess and better prepare the asset owner or operator with the savvy to pursue the most effective method in solving any diagnostic impact that may be experienced in the maintenance and sustainment paradigm.